The boat shows and Daylight Savings Time have come and gone. Winter is arriving in Chesapeake country, regardless of what the calendar says. 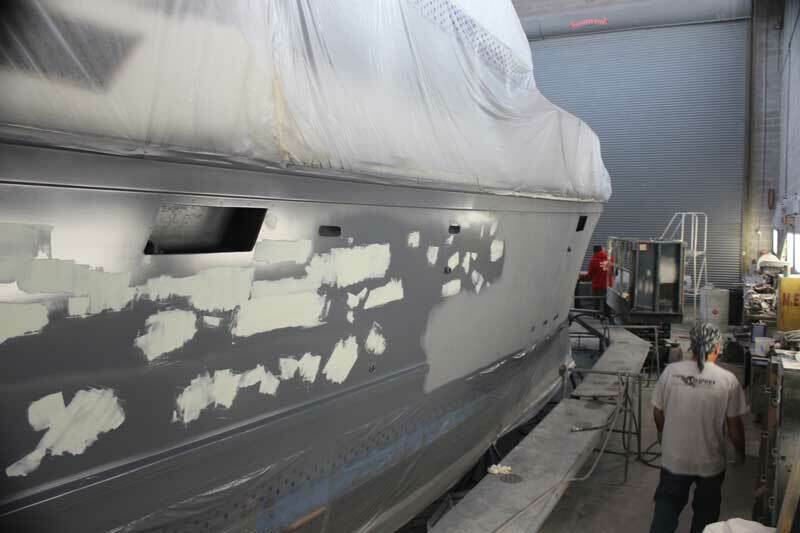 Haul outs, storage, winterizations, and winter projects dominate the December 2018 boatshop reports. The busy pace of the summer looks like it will continue into the winter months. For report's from past months, visit proptalk.com/category/boatshops. 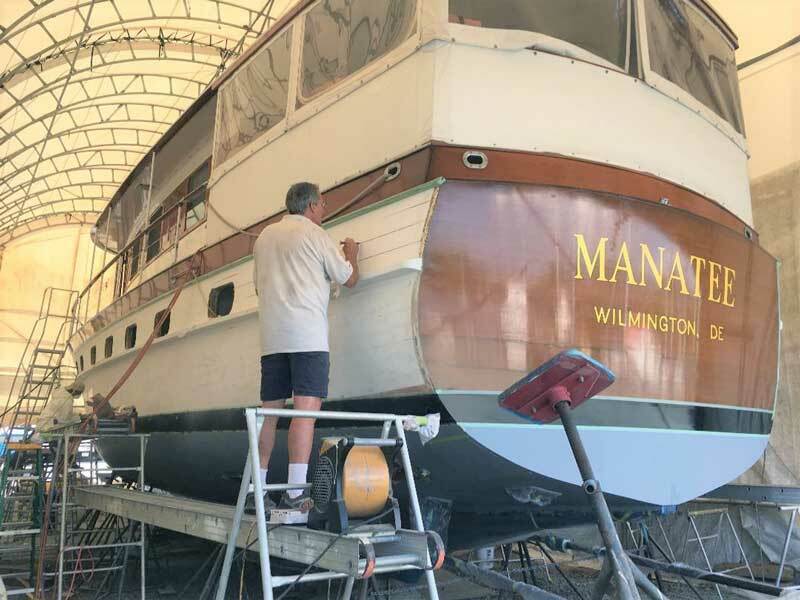 Peter Bell caulking hull seams on the 1950 Trumpy Manatee at Hartge Yacht Yard in Galesville, MD. 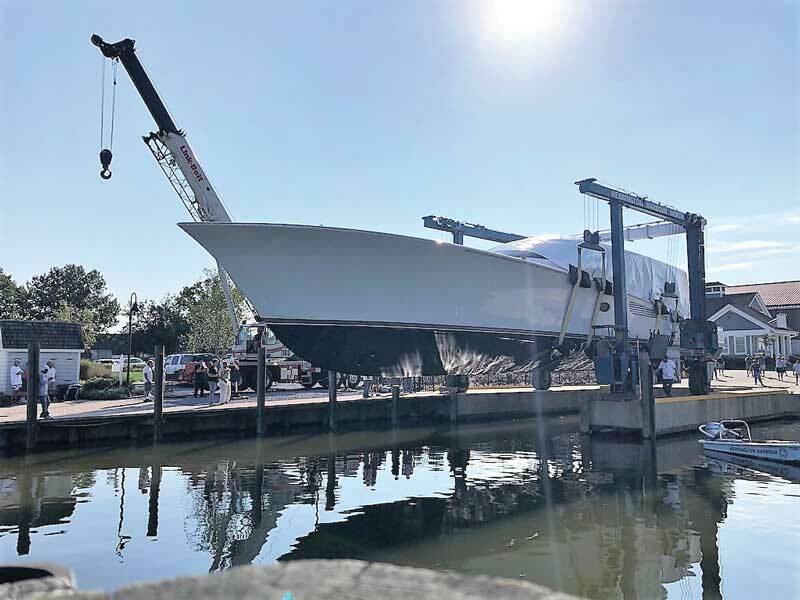 The good times do not appear to be limited to our area, as the following excerpt from John Patnovic’s newsletter at Worton Creek Marina in Chestertown, MD, shows. Scott Anderson from Liberty Marina in Edgewater, MD, reports that most of the transient boats from the shows are gone, and winter haul outs and storage are well underway. Winter plans for the marina include reconfiguring some docks and adding additional boat lifts. At Weaver BoatWorks in Deale, MD, 18 Reeler, a Weaver 97 Enclosed Bridge, went in the water in early October. She is currently at the fitting out dock and will spend a few months there. In the meantime, Weaver has three more boats under construction; a Weaver 70 TS, a Weaver 43 SJ, and a Weaver 50 FC. 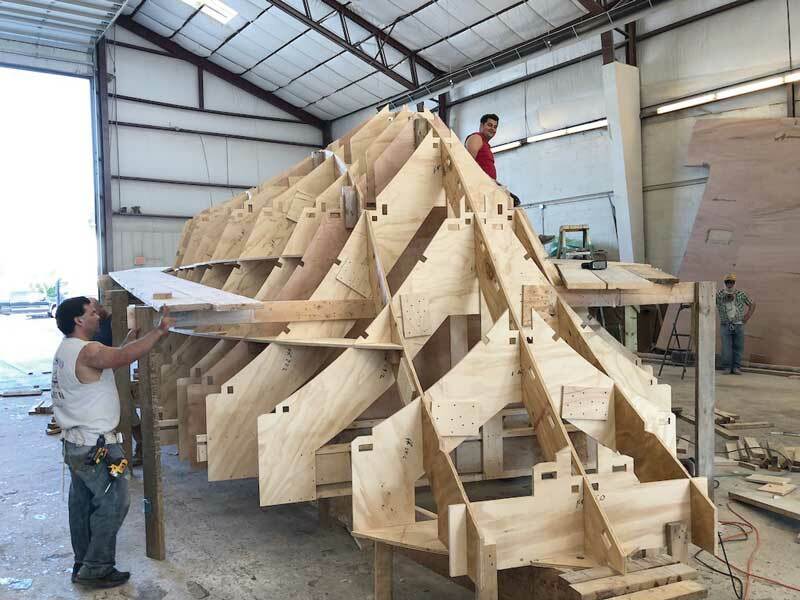 A Weaver 50 in the first stages of construction at Weaver BoatWorks in Deale, MD. Regular readers of this column will recall that over the last two years, we periodically reported on the progress of the Chesapeake Bay Maritime Museum’s restoration of the nine log bugeye Edna Lockwood in the museum’s shipyard at St. Michaels, MD. That process is now complete as reported in the following release from Bethany Ziegler. The restored 1889 bugeye Edna Lockwood awaiting her masts on the railway at the Chesapeake Bay Maritime Museum in St. Michaels, MD. “Built in 1889 by John B. Harrison on Tilghman Island for Daniel W. Haddaway, Edna Lockwood dredged for oysters through winter, and carried freight—such as lumber, grain, and produce—after the dredging season ended. She worked faithfully for many owners, mainly out of Cambridge, MD, until she stopped “drudging” in 1967. In 1973, Edna was donated to CBMM by John R. Kimberly. Recognized as the last working oyster boat of her kind, Edna Lockwood was declared a National Historic Landmark in 1994. Edna is the last historic sailing bugeye in the world, and will undertake a heritage tour around the Chesapeake Bay during summer 2019, funded by the National Park Service. 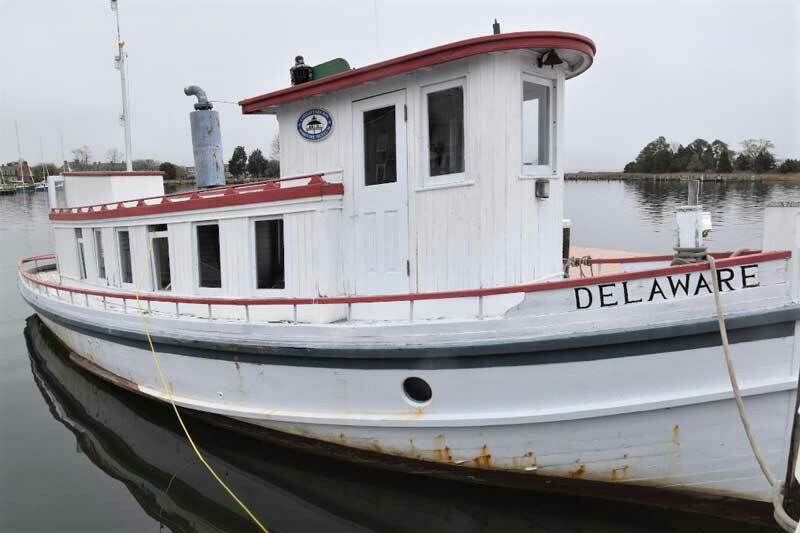 The 1912 river tug Delaware is the next restoration project at Chesapeake Bay Maritime Museum in St Michaels, MD. If you are wondering what the busy folks at CBMM to do next, read on: Shipyard Manager Michael Gorman reports that work on 1912 river tug Delaware will soon begin in full public view. The stem-to-stern restoration kicks off in early December with documentation of her existing lines, which CBMM shipwrights will use as plans to guide their work. A number of Apprentice for a Day Shipyard Programs have been scheduled to allow the public to get hands-on with the project. (Find dates and details at cbmm.org/shipyardprograms.) The next steps in the process will have recently hired shipwrights and apprentices starting to remove old wood from the tugboat and beginning to pattern out for her keel removal. Delaware’s Detroit 671 engine will be removed and winterized until CBMM Marine Mechanic Josh Richardson can begin its maintenance. To keep up with this restoration and other activities, visit cbmmshipyard.org. 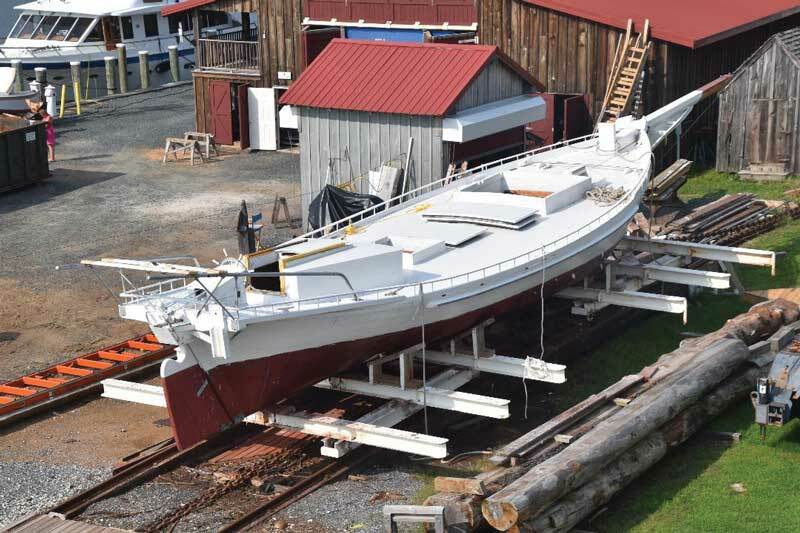 Traci Cimini of the Calvert Maritime Museum (CMM) in Solomons, MD, sends us this report of another project completed by the volunteer Patuxent Small Craft Guild (PSCG). 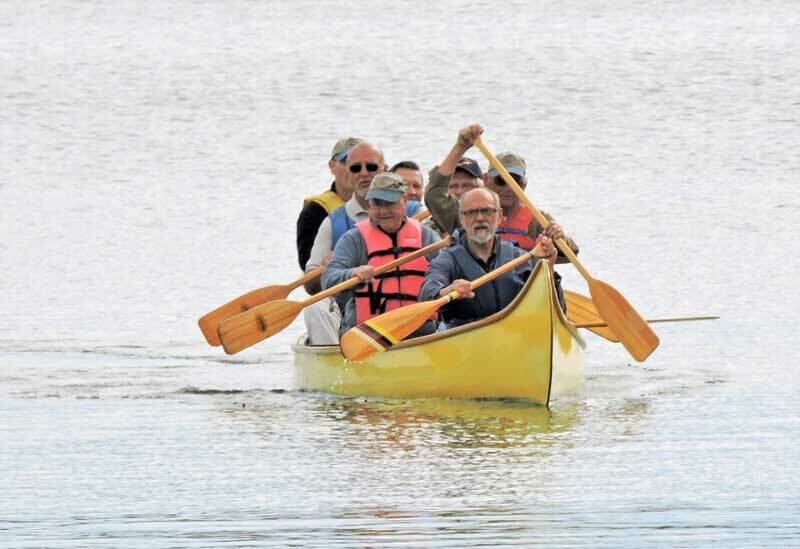 How many volunteers can paddle a big canoe? At least seven in this 25-foot 1960 Old Town Camp Canoe restored by the Patuxent Small Craft Guild at Solomons, MD. David Low reports they are busy doing winter haul outs at Herrington Harbour North in Tracys Landing, MD, and at Shipwright Harbor in Deale as well. It will be a busy winter at Herrington Harbour North. Plans beginning in December include demolition of the old F dock, dredging of the area, and construction of a new dock with floating piers, a first for the marina. In the meantime, dredging continues on the main channel out by the breakwater. 18 Reeler, a Weaver 97, being launched at Herrington Harbour North in Tracys Landing, MD. There are other changes along the banks of Rockhold Creek in Deale, MD, this winter. In September Hamilton Chaney purchased the Rockhold Creek Marina and then negotiated a long term lease with Galahad Marine to manage and operate the facility. Galahad Marine is a marina acquisition company based in Cape Coral, FL. In 2016 Galahad purchased McDaniel Yacht Basin and Shelter Cove Yacht Basin on the Upper Chesapeake Bay in North East, MD, and Norview Marina in Deltaville, VA.